The Almagor terror victims’ organization is accusing the government of joining the PA (Palestinian Authority) “media spin” intended to obtain the release of terrorists. Meir Indor, the organization’s leader stated that recent statements by government officials referring to demands to release terrorists Marwan Barghouti and Ahmed Sa’adat in order to obtain the release of Gilad Shalit is a PA move to obtain the release of additional terrorists in a prisoner exchange deal. Indor added that the statements by officials rejecting the “new Palestinian demands” is nothing more than a media spin intended to divert attention from the reality that Israel plans to capitulate to terror and release a large number of terrorists. Members of terror organizations who were released from Israeli custody after being defined as not having “blood on their hands” perpetrated 14 terror attacks in the past several years. In them, 132 Israeli civilians were killed and many others were injured, according to a report released over the weekend by the Almagor Terror Victims Association. The organization issued a list of 14 major attacks carried out or engineered by released terrorists, including the 2002 Park Hotel attack in Netanya (29 killed, 155 injured), the 2002 Karkur Junction attack (14 killed, 42 injured), the suicide attack at Jerusalem’s Cafit Cafe (11 killed, 20 injured), and the 2003 suicide attack at Cafe Hillel, also in Jerusalem, in which seven people were killed and many more were injured. Yesterday morning Almagor held a protest vigil of families of terror victims, across from the Prime Minister’s Office in the capital. Among the protesters was Debra Appelbaum, whose husband, Dr. David Appelbaum, and 20-year-old daughter Nava were killed in the Cafe Hillel attack. The terror victims’ organization was responding to a statement by EU Foreign Minister Javier Solana who favors ending the economic sanctions against the PA as a result of Fatah entering the government. Sunday morning Almagor held a protest vigil of families of terror victims, across from the Prime Minister’s Office in the capital. “The first intifada began with the Jibril prisoners’ release; and ‘Hizbulland’ is now forming in the northern Samaria because of (Elhanan) Tennenbaum’s prisoners’ release deal. This means that the release of terrorists will cause more Jewish victims. Bachrach added that former Attorney General Elyakim Rubinstein said that 80 percent of the released prisoners resume terrorist activity after their release. “I understand the mothers of the captives, I wouldn’t like to be in their place, but we will return her son to her, and the son of someone else will be kidnapped. I paid a heavy price for the captives’ release who were not released at the end. I feel as though my child was lost in vain,” she concluded. A new report released Thursday illustrates the phenomenon of released terrorists returning to nationalist murder. The report, by the Almagor Terror Victims Association, demonstrates that at least 14 of the major terrorist attacks in recent years were carried out by terrorists released from prison in the context of various “good will gestures” and Israeli prisoner deals. All of them were released with assurances to the public that they did not have “blood on their hands,” – a euphemism for those prisoners whose deadly attacks failed to prove fatal. Between the years 1993–1999, in the context of “confidence building measures” and prisoner deals, Israel released 6,912 terrorists. 854 of them (14%) were arrested subsequently for murder, attempted or otherwise. There are no statistics available for those who returned to non-fatal terrorist activities, instruction or logistical support. November 27, 2001: Carried out shooting attack near Afula, murdering Michal Mor and Noam Guzofsky. March 21, 2002: Dispatched a female suicide bomber to Jerusalem’s King George Street, murdering three Israelis, Yitzchak Cohen and Gadi and Tzipora Shemesh – 81 more were wounded. February 25, 2002: Initiated attack on Jerusalem’s Neve Yaakov neighborhood, murdering a female police officers and wounding 10. March 5, 2002: Responsible for attack on Seafood Market in Tel Aviv, murdering Israelis Eliyahu Dahan and Yossi Havi, wounding 31. March 4, 2001: Dispatched Herzl street suicide bombing, murdering Naftali Din, Shlomit Ziv, Yvgeni Malkin and wounding 56. May 18, 2001: Responsible for suicide bombing of HaSharon Mall in Netanya, murdering Miriam Wachsman, Yulia Tartiakov, David (Moti) Yarkoni, Vladislov Sorokin and Tirza Tishbi, and wounding 86. Helped plan and carry out Park Hotel Passover massacre, murdering 29 and wounding 155. Just seven months after release, on September 9: Blew himself up at Jerusalem’s Café Hillel, murdering David Shimon Avizdris, Yehiel Emil Toubol, Shafik Karem, Alon Mizrachi, Gila Moshe, Dr. David Yaakov Appelbaum and his daughter Nava – one the eve of her wedding. 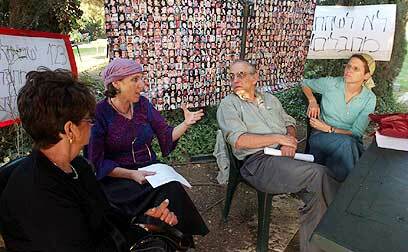 Less than half a year later, on May 18, 2003, shot Kiryat Arba residents Gadi and Dina Levi to death near Gross Square in Hevron. Planted explosives that killed IDF soldiers Cpl. Asher Zagori, Cpl. Moshe Peled, Cpl. Ron Lavi, Cpl. Matan Biderman and others. January 9, 2002: Oversaw infiltration into IDF’s Africa Lookout, killing four soldiers. March 7, 2002: Shooting attack at Atzmona pre-military academy, murdering Ariel Zaga, Baruch Marcus, Eran Pikar, Aharon Krugliak and Tal Kutzweil. June 5, 2002: Responsible for bus bombing at Megiddo Junction, murdering 17 and wounding 42. October 21, 2002: Blew up jeep near Egged bus at Karkur Junction, murdering 14 and wounding 42. September 18, 2002: Organized Umm El Fahm Junction bombing, murdering officer Yossi Ajami and wounding one seriously. December 26, 2002: Tried to shoot and kill IDF soldiers attempting to apprehend him. He was killed in the process. September 26, 2003: Two months after his release, he infiltrated the Hevron Hills town of Negohot, murdering Ayal Yaverboim and slaying a baby, Shaked Avraham. Planned and oversaw attack at Tzrifin IDF base bus stop, murdering eight. Involved in planning of Café Hillel attack. Became senior Hamas commander in Hevron and shot at soldiers who came to arrest him after he oversaw several attacks. The report was dispatched to Prime Minister Ehud Olmert, Defense Minister Amir Peretz, Chief of Staff Dan Halutz and interim Justice Minister Meir Sheetrit. The umbrella organization is made up of families of slain terror victims and others affected personally by Islamic terrorism in Israel. They are issuing a call to the government to refuse to release terrorists in return for the three IDF soldiers being held by Hamas and Hizbullah. Group says releasing terrorists for kidnapped IDF soldiers will endanger many lives, encourage more abductions. Israel should not pay “any price” to win the return of its abducted soldiers, the chairman of the Terror Victims Association, Meir Indor, argued recently. “What is the use of one release, when we thereby bring many citizens into the circle of immediate risk?” he asked. Attached to Indor’s letter was a list of terror victims killed by released prisoners. These included Hagar Ben-Ovadia, murdered in East Jerusalem by two Fatah men released in the 1985 Jibril deal, who were caught only after they killed an Italian tourist six months later; and Eyal Yeverboim, 27, and seven-month-old Shaked Avraham, who were murdered by terrorists who had been released two months earlier in order to “strengthen” Palestinian Authority Chairman Mahmoud Abbas.